We’re on the GAPS intro diet again, which means what we can eat is pretty restricted. We’re on day three and my seven-year-old has been begging for chili. 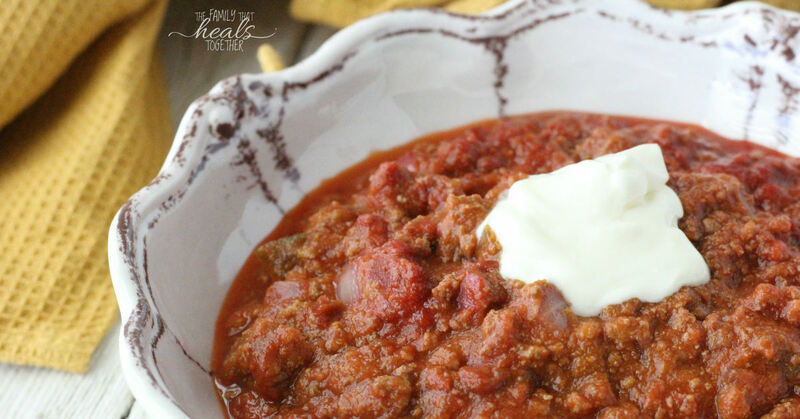 I love to indulge my boys’ requests, so I knew I had to come up with a beef chili recipe we can have right now. Even better than treating my boys to foods they love, I love sneaking in nutrition that they don’t even know they’re eating. I’m ornery like that. Plus, when I can be sneaky, there are no battles of will to contend with. 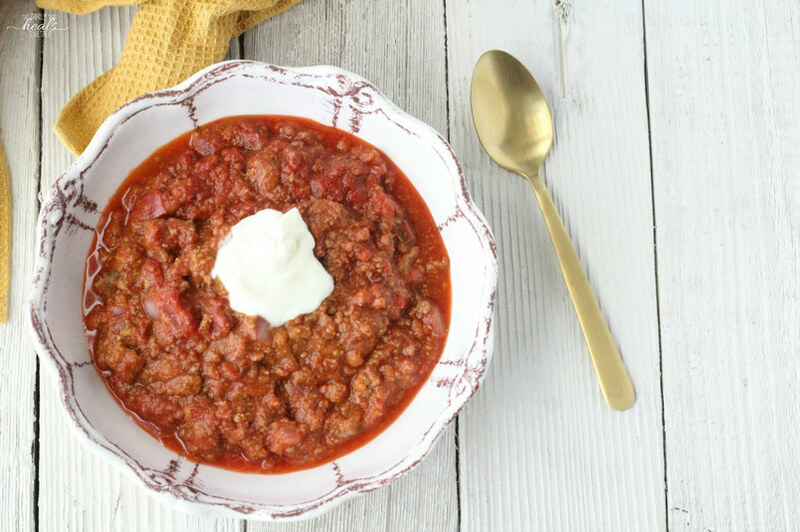 This beef chili recipe is packed with nutrition that my kids didn’t even suspect. I like to make carrot and butternut squash soup every day on GAPS intro because it helps us get in adequate carbs. I love it… everyone else likes it ok. Except the seven-year-old, who cries every time I make it. I decided I needed to get some carb-y carrots into him another way. Sneaky sneaky. Cooked carrots, beets, and onions add healthy, blood-stabilizing carbs, plus lots of great nutrients. You’ll also find tomato puree, garlic, more veggies, hamburger meat, and beef meat stock. I hope your kids love it as much as mine have. Be sure to serve it with some creme fraiche– it’s way tasty that way! Note: I blended my sauce in my Vitamix, which I love for lots of things, except blending hot things, so I’m planning to get this stainless steel stick blender so as to avoid blending in plastic. Combine ingredients in a stock pot and bring to a boil. Reduce heat to low and simmer until vegetables are soft, about 30-40 minutes. Use a stick blender or high powered blender to blend ingredients into a smooth sauce. Rinse liver and place in a bowl of water. Add 1 tsp fresh lemon juice and allow to sit for about 20 minutes. This improves the taste. While the vegetables are simmering for sauce, add ingredients to a large, deep skillet and cook on medium-low until meat is brown and cooked through. If the stock cooks out, add more to be sure everything is cooking in stock and not frying. Once you've blended your sauce and your beef is cooked, add the sauce to the beef mixture and stir well. 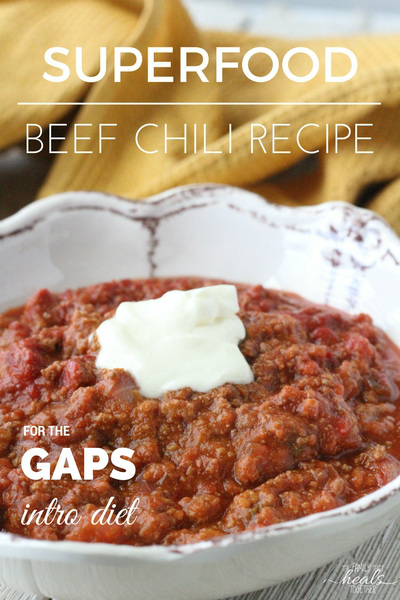 Do you love the idea of a beef chili recipe with super nutritious ingredients? Be sure to share using one of our links for friends who like to be sneaky in the kitchen too. Thanks, just what I needed today! How do you prepare the liver? Do you chop it up before cooking? Does it break up while cooking? I defrost it, soak it in water with some apple cider vinegar for at least 15 minutes or so, then blend it into a slurry in the blender before adding it to ground beef as it’s cooking. Oh my goodness, this is delicious! I’ll be starting Gaps stage one in the coming weeks and just made a giant batch of this to pull out of the freezer and make life easier and more delicious. Thanks so much. I’m so glad you loved it Lauren!